Ludlow Sustainability Group | Southern Marches Area Quaker Meeting. The Sustainability Group measured the carbon footprint of the Meeting covering energy use, and also travel to meeting, and found that travel to Meeting was quite large as we are a rural meeting. So we asked everyone to keep a record of the mileage and the type of car they use in getting to Meeting for Quaker events in the month of June in 2015. We then multiplied it by 12 to get the approximate annual amount. The result worked out at about 3.8 tonnes of carbon dioxide. We therefore asked the Meeting to donate £100 to the Woodland Trusts Woodland Carbon Scheme, thereby creating 100 square metres of woodland, which will absorb 4 tonnes of CO2 in its lifetime The Meeting actually agreed to donate £200, and to review the matter annually. The above figures indicate that over the last three years usage of the existing Meeting House by Friends and hirers has resulted in a declining energy consumption. Given that no significant structural changes have been made in this period, this decline can only be attributed to milder weather, changes in the pattern of usage and vigilance over the avoidance of waste. 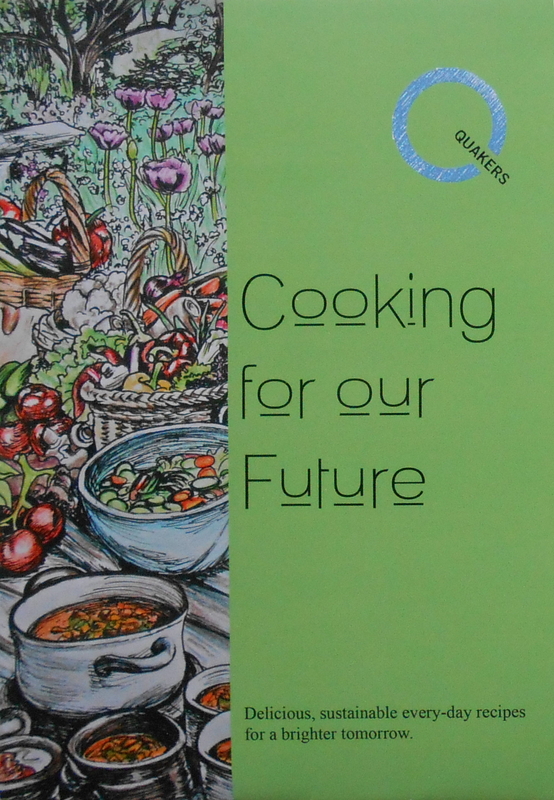 The Ludlow Sustainability group has produced a small recipe book to tempt people to try new dishes which aim to reduce our impact on our planet. 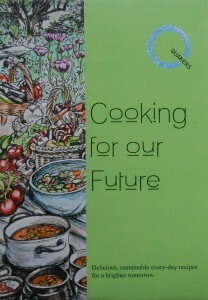 It is called ‘Cooking for our Future’ and was made up from 21 recipes given to us by Quakers in Ludlow. There is also a table which gives a rough estimate of the CO2 impact of foods and a short section on tips to reduce our impact even more with cooking methods. We are asking for donations and would suggest that £2 a copy would cover the printing costs. Does the economy work for you? Some nineteen people attended this meeting organised by the Sustainability Committee on Saturday May 6th in the Ludlow Meeting House. There were members of the meetings, some from other meetings in the area and a number of non-Quakers. One of these mentioned to me that she had come because she had a high regard for the Quakers; independence of political parties. Unfortunately Alison Prout was unable to come since she was ill and the event was confined to the morning. Charles Grimes of Positive Money from Hereford began the morning with a very good talk. He is a very engaging speaker who was not afraid to give personal examples of how the economy did not work for him. He was followed by our member Daniel McDowall of the Ludlow Campaign for Fairness who spoke on Fair tax towns and the harm that tax evasion did to the community. I was tempted at this point to look in Quaker Faith and Practice to see what it said about banking, and curiously, although bankers are always mentioned in Quaker history, the term does not appear in the index. Perhaps this covered by the qualification at the end of Chapter 23 that Friends are still seeking for a corporate view. Back to Charles Grimes who explained the purpose of Positive Money. This is to make sure that money works for all and not just for the richest 1% of the community. After the financial crash of 2008-9, the government and Bank of England launched a programme called ‘quantitative easing’ which creates some £70 billion of new money and pumping it into financial markets through the purchase of government bonds. This has the effect of supporting those who have assets such as property and shares, and so making those who have the most of those assets, even richer, and also benefiting tax-dodging corporations. This leads to more debt, worsens the housing crisis and makes the gap between the rich and poor more unequal. If positive easing has to happen, it should be directed, not towards inflating the property and share markets but by directly investing in productive industries, in community welfare, in employment and the health service. In this way it could improve the health and the community of all and not benefit the richest.